The Ribbon Trail was designed and planned as a multi-use path, and has been identified on the City’s bike map for years. Every other multi-use path in Eugene is shared by bicyclists and pedestrians, and the Ribbon Trail should be no exception. The issues specific to Hendricks Park could be dealt with in a variety of ways. Clearly marking the park boundaries and posting the rules is essential. In addition, installing a barrier that requires bicyclists to dismount, paving the short section of trail between the paved section and the park boundary, or modifying the Park Master Plan are among the strategies that could reduce, if not eliminate, the use of bikes on Park trails. BjÃ¶rklund’s letter also relates several safety concerns leading to the closing of the trail. These concerns were echoed by The Obsidians Board and the Friends of Hendricks Park Board. Both groups opposed allowing bikes on the Ribbon Trail. However, GEARs, the Lane County Mountain Bike Association (LCMBA), Disciples of Dirt, Safe Routes to School, and the Poplollies women’s cycling group all supported allowing bikes on the trail. The Bicycle and Pedestrian Advisory (BPAC) was notably on the fence about the issue: a motion to recommend allowing cycling on the trail was defeated. Ultimately, they passed a motion to make no recommendation. 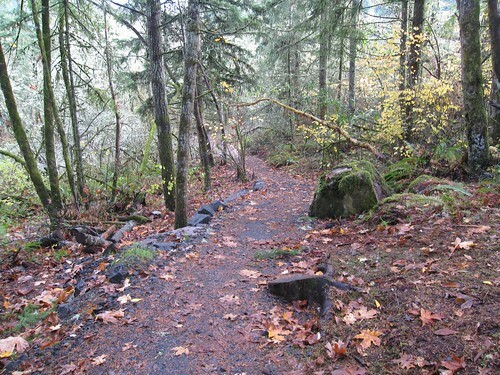 Staff concerns included tight corners and steep slopes at the south end, side slopes within the trail bed that might lead to trail degradation in wet conditions, and limited space for hikers or bikers to move aside to allow safe passage. Staff also noted the relatively short length of the trail (~3,000 feet), and its relative isolation from other bike-accessible forest trails. However, sources close to the project claim that this trail was originally designed to be a multi-use trail, but wasn’t built to the correct specifications. An error in construction resulted in the trail’s less than perfect standards for mixed use. This shifts the fault of the “‘unsafe” conditions the Parks Department. There are examples all over the country of trails just like the Ribbon Trail being very successful as multi-use trails. Mountain bike trails are rare in Eugene, partially due to the closing of most of the Ridgeline Trail system to bicyclists in the early 90’s. This results in community fears that stem from a lack of experience. Many Eugene hikers don’t have any experience sharing a trail with cyclists and are not aware that this is usually very successful – like at the nearby McKenzie River Trail. There is nothing special or rare about the Ribbon Trail that makes it uniquely dangerous when compared to thousands of other shared use trails all over the country. While we recognize that conflict among various user groups on the trail could occur, this problem is not unique to the Ribbon Trail. The possibility of conflict is no reason to close the trail to bicyclists. Bicyclists should not be presumed guilty of bad behavior with no opportunity to demonstrate that they can share the trail responsibly. (1) A commuter route to the top of the 30th Avenue hill for bicyclists en route to LCC, and (2) general expansion of opportunities for mountain bikers to ride trails in an attractive natural setting within or close to the urban area, to avoid the need to drive somewhere outside the city for this recreational experience. The good news is that a planned EWEB summer 2010 construction of an unpaved bike path connection along a new water line between Central Blvd and Spring Blvd should create a commuter route to the top of 30th Ave from the north. However, the second goal of creating and expanding mountain bike routes near the urban area has been completely unfilled. BjÃ¶rklund explains the trail’s relative isolation from other mountain biking trails and its short length of just over 1/2 mile means that it is not a good candidate to expand the urban mountain bike trail system effectively. However, if the POS uses this logic on all its newly built trails, all new trails will be in relative isolation by default. This also prevents the possibility of linking together several short mountain biking trails in the future. In addition, while a 1/2 mile isolated trail may not be great for adult cyclists, it’s perfect for introducing children to mountain biking. Sites or trails other than the Ribbon Trail may better accommodate the larger needs related to bicycle access in the Ridgeline trail system. While we cannot commit to a time line for conducting a systemâ€wide trail access study, given the current budget picture and other priorities already identified in the PROS Project and Priority Plan, it is our intent to conduct such a study when it is feasible. Although we did not open this trail to bicycles, we have heard, loud and clear, the community desire and need for additional mountain biking opportunities, and we will continue to explore opportunities for expanding the network of trails open to mountain bikes. The Parks and Open Space Division intends to review the status of the Ribbon Trail in the future as part of a system-wide study of trails and trail access throughout the Ridgeline system. However, due to current and upcoming budget reductions and constraints, as well as previously established priorities for the park system, we are not currently able to commit to a particular time frame for completing this system-wide trail access study. This is sobering news, because if Eugene doesn’t begin to make this a priority we risk having many of the same problems that Portland has recently experienced. There is clearly a demand for local mountain biking trails. If the city does not provide trails then illegal trail building could proliferate, much like what happened in Portland’s Forest Park. Urban mountain biking trails are also important to Eugene’s overall status as a bike friendly city. 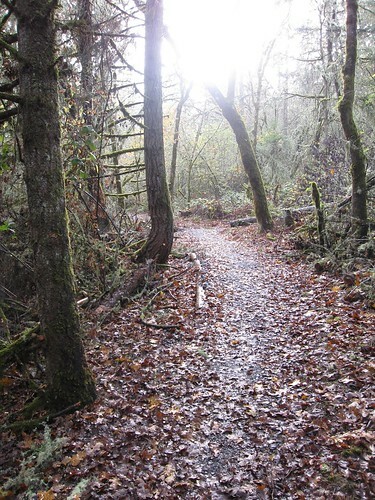 One of the areas Portland was highlighted as lacking in their Platinum status was in their lack of mountain biking trails. This is also one of the reasons why Portland was ousted from its 15 year run as Bicycling Magazine’s #1 bicycling city by Minneapolis, which has several urban mountain bike trail corridors. Bragging rights aside, there are even more tangible reasons why Eugene needs to re-prioritize developing urban mountain bike trails. A high school representative was at the Ribbon Trail “bike stakeholder” meeting and mentioned that allowing bikes on the trail was a very important issue for him and his friends since they don’t drive and would like something near enough to ride to. The Citizens for Appropriate Transports (CAT) local Trips for Kids program must also drive participants out to Oakland to mountain bike since there is no good location in town for kids get active in this great way. I am not trying to demonize Neil BjÃ¶rklund with this article. He was clearly pressured from both sides of the issue, and he and his staff no doubt made the decision that they felt best served the interests of everyone involved. The message that we, as cyclists, should take away from this decision is clear. If we really want urban mountain biking trails, we need to pressure the city to re-examine their trail priorities. We also need a dialogue with pedestrian-oriented individuals on the BPAC and groups like Obsidians to explain that cyclists and hikers co-exist on thousands of trails just like the Ribbon Trail all over the country. The pressure to close the trail to bikes stemmed from inexperience and mistrust of mixed-use off-road trails. This is an issue that we must resolve if we are ever going to see change. Below is a PDF of Neil BjÃ¶rklund’s letter to stakeholders. Nice writeup Seager. I’d really like to see a connector to the top of 30th Avenue for easing the bike ride to LCC. Something Eugene is seriously lacking is a strong voice among the Mayor and Council to advocate for cyclists. We have a few kind souls in city staff, but it’s not enough. Anyone interested in running for city council or mayor? That is disappointing- Hopefully a solution will be found where everyone can enjoy the trails. Sharing is caring right? Just FYI, you spelled Hendricks park wrong. You used an x. Just thought you should know. This is stupid. We should be able to ride where ever we want to. I think if you are a good rider and you have control then you “should” be able to ride around people. Being smart as a rider is important as being a safe driver in a car. The thing is, we need to designate that hikers stay to their right and not walk 2 or 3 abreast. Traffic laws on the roads should be adapted to the trails. Put passing lanes and no pass areas in congested areas. Usually it is the pedestrians and hikers that are the major problem. They think they are free to walk all over the trails and sidewalks. They pull out in front of you and don’t have their dogs under control. Their really should be a traffic system designed for riders and hikers. It should be required for riders to follow some important rules as well. Like informing hikers of a pass, by verbally saying, “On your right” or honking a horn or ringing a bell. If you have a group of people that are unsafe to pass for any reason then you should dismount and attempt to walk your bike around them. This really isn’t a big deal. You shouldn’t just ban bicycles all together. I hate to burst GEARS’ bubble, but the Ribbon Trail is not listed as multi-use on the Eugene/Springfield Bicycle Map. In the ’08 version (most current on Eugene’s site, link below), the part off 30th is symbolized as a ‘hiking trail’. The gap between there and Hendricks Park isn’t even symbolized as a route, just a park. That said, it’s fairly shortsighted for the city to not promise some future trail improvements for what could easily be a win for all involved. I wonder how many of these pro bike use comments have come from people who have actually used the trail in question. There are several sections that would unquestionably unsafe when biker and hiker meet unless the biker were to dismount. Perhaps the trail should have been designed differently (although that does not seem feasible on some of the steeper sections) but the fact of the matter is that it was not. I don’t expect that this will make a lick of difference in any event as many bikers seem to feel that biking anywhere they please is their right (as the commenter above already said). I have already been forced off the trail by a group of mountain bikers on more than on occasion, fortunately nearer 30th where there is not such a drop off the side. Saying that it is the cities fault if bikers create their own trails instead is ridiculous, with that logic I ought to be able to drive across your lot if it’s more convenient than using the road that went around instead. It’s not as if there’s only one way between Hendricks and 30th. Incidently, the complaints leveled against hikers on the trail are akin to the complaints that drivers claim about bikers. Ironic. If only the irony could extend all the way to cyclists having the power to outlaw cars from roads that have clearly been shown to be unsafe for sharing between bicycles are cars. This is a distorted statement. Cyclists ARE capable of walking, you know. The trail is only closed to bikes, NOT people who happen to be cyclists. Also, there are other appropriately constructed bike paths which can withstand the destruction which mountain biking creates. Walking does NOT cause wilderness degradation at the same rate as mountain biking. Completely agree with Emily. This is about appropriate uses. You don’t see a McDonald’s on every corner of a single family neighborhood do you? “Tight corners and steep slopes” are two very good reasons to curtail the use. Not to mention wet conditions. To suggest that this trail is unsafe for multi use is absurd. The trail averages 4-6 feet in width. It is graded flat as a golf cart path, and while there are a few short steep segments, the sight lines are very good thanks to the expert trail builders, and the safety issues on the Ribbon trail are much less of an issue than they are at the Headwaters trail, or the north side of Mt Baldy, both of which are trails recently built for multi use. While Eugene flounders, Oakridge, Jacksonville/Ashland, Bend, Portland, and other communities continue to expand their multi use trail networks to the delight of mountain bikers and other trail users. One day, hopefully we can learn from their success. In the meantime, Mountain bikers will continue to get in their cars and drive 30-60 miles to get to trails instead of riding from their homes. Really? The park is hardly wilderness. Your comments are uneducated and elitist. Yes the trail is closed to cyclist! If they are walking they are a walker or hiker not a cyclist. It’s not a mountain bikers fault that a few hikers are not aware of anyone other than themselves while out on the trails. I have come upon folks while running and hiking on the trail and find equal part culpability of “danger”. So if I am perfectly capable of running up behind somebody and asking them to pass…it’s okay, but if I ride up behind somebody and ask them to pass it presents a far great amount of danger? Also, if the parties are approaching “head on”, won’t the rider, runner, pedestrian, hiker all have roughly the same amount of time to react if all parties are simply aware of the others presence? When did mountain bikes, or any bicycles for that matter, become wider than the path cut by a pedestrian. Are trekking poles, deep lugged hiking boot or aggressive sole on trail running shoes outlawed on the trail? No, yet I would argue that based on the amount of damage done by pedestrian traffic to the ridgeline trail would certainly suggest otherwise. Yet, you state that the trail system has issues with safety. What about requiring these same items to enhance pedestrian safety on the trail system’s “dangerous” areas. @Emily, have you been on Ridgeline during the wet season in the last 4 years? I’d imagine if you had, you would revise your statement about pedestrian versus bicycle damage. Perhaps you should review the Leave No Trace website. Also, can you point me to an area within 100 miles of here that has been destroyed by mountain bike traffic and overuse? Certainly you know of one to make the statement you made above. closing any trail to any “group” is lame and discriminatory at best… we should all see the best in people, despite of where their identities are… bikes should have a right on this trail… if there are signs of abuse… it should be dealt with by dealing with the INDIVIDUAL that breaks the rules… you don’t just generalize, and prejudice a whole group of law-abiding, healthy, and environmentally conscious people for the acts of the few… lame. Emily & Koko’s comments are funny! I don’t recall anyone advocating a McDonalds Restaurant on every residential street corner. Better check with Neil about doing so first. BTW, Big Macs are 2 for $4 right now. Ed, Emily and Koko seem to be completely ignorant of the facts. First of all, there are tens of thousands of miles of shared use trails in the country and people cope very well with sharing. I ride regularly on trails that are less than a foot wide, rocky and on steep slopes. I encounter hikers, runners and equestrians. With very few exceptions everyone gets along just fine. I came up behind a beginning equestrian on a narrow mountain trail last year. I followed her at a safe distance for about 10 minutes until she came to a place where she get off the trail and let me pass. EVERY mountain biker knows that the rule of the trail is that mountain bikers yield on the trail to hikers and equestrians. Almost every hiker though takes a half step off the trail and lets me pass. They exercise common courtesy because they know either that I am faster because I am going downhill or I’m working really hard going up the hill. The encounters are uniformly pleasant. As to damage to the trail, there is ample research. it shows that a rider on a bicycle has the same amount of impact as a walker and horses have enormously more impact. The author does a very good job summarizing the issue, but I think he is much too kind to Neil BjÃ¶rklund. I was at one of those stakeholder meetings and several things were clear. One, the opinions and desires of people who ride bikes are subordinate to the opinions and desires of those who do not. Bicycle riders are unimportant to the city. Second, he would not expend ANY extra effort to change things so that bicycles could be allowed. Third, despite overwhelming evidence that people share trails with no problems, he chose to believe those who have unfounded fears of bicycles. Much is made of the fact that the Ribbon Trail is only 3000′ long. That is not the point. The Ribbon Trail is part of the Ridge Line trail system. If they open it all up to bikes, I would ride from near my house in the SW hills to the trailhead on Blanton and ride all the way around to the edge of Hendricks Park and back for an excellent in-town ride. The next nearest place to ride is at least a half hour drive away. BTW, I think Josh is a jerk too. No mountain biker I ride with thinks that we should be able to ride wherever we want to. For the record, I am 60 years old and took up mountain biking at age 50 when my knees went out and I could not run anymore. I had what seemed like a permanent limp. Six weeks after taking up biking, the limp went away. Nice to see the comments flowing on this story. It seems to me the city of Eugene is delussional about having and opening up trail access to those on the Ridgeline extension from Hendricks Park to 30th Ave.? Whatever happened to reasonable accomendations to access for all to use these trails? Hasn’t anyone on the city council ever been on a mountain bike? Has anyone on the council been to a trial building party with other mountain bikers to learn the skills of trail building with those in the DOD or other mountain bike clubs in Lane County? My bet is – probably not and a 50/50 chance they don’t even want to do deal with the ideal of having a favoriable rating in the bike and recreational magazines that would enhance more growth for recreational purposes for those that move into the Eugene/Springfield area. Its funny to know – the peopple, that sit on the bench of the council chambers call themselves, “City Councilman or Councilwomen”, but – they done their jobs as an elected official of their wards? 50-80% of the people this city would probably say, the current city council is biased against all forms of recreation and mountain bikers alone, regardless of what they see “has their vision” of the city’s future. I would suggest and encourage, those on the planning committee’s and those in other groups to join mountain bikers in a skilled trial building party and learn about the lesson it goes among building trails in Lane County for all to use. Be forewarned, what you learn from these groups that build such trials in such an enviroment, will enhance ones understanding that Mountain bikers alone aren’t the evilish enemies at the gate – they’re actually there to help and enhance the enjoyment for all, that use recreation of all means, from hiking, to horseback riding to mountain biking everyone is likely to get along with one another. Making it a “war cry” and CLOSING such trails in my opinion creates bias among those the recreate in this city – I would welcome such an endeavor that all trails such as the Rideline trail be open to all access with no specific closure. Trust me – everyone’s blood pressure would be more stable than an alligator can swallow, than a crow can fly on the city that was founded by our founder – Eugene Skinner. Given what I know about public process, there are 2 really good ways to have a significant impact in planning. The second is through huge donations of money or land, and is maybe not so healthy – though if anyone could donate land in the same area for a bike-only trail, that would help. The first is at the very beginning of the process, and this is where everyday people can make a difference. So, guess what: it’s very early in the process for planning the Ridgeline Trail extensions through Iris Ridge and on to Fern Ridge or Amazon Creek. RIGHT NOW is when the bike community should be giving input on these projects, not after they are built. Please let Neil and the City Parks and Open Spaces office know what you think.